In a need for lower costs and more performance, IT managers are trying to pack more computing power into smaller footprints. Developing a computing infrastructure utilizing blade servers is one way to go. However, even this revolutionary approach has its advantages and disadvantages. What are the benefits of a blade server? Blade servers allow more processing power in less space which simplifies cabling, storage, and maintenance. 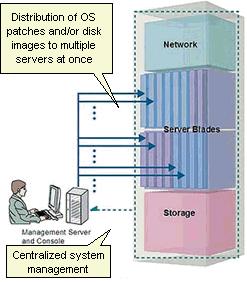 Blades are often used for grid computing. The advantage of blade servers is not only that one "cabinet" houses multiple servers that share power source and other components, but also from the consolidation of related resources, such as storage and networking equipment, into a smaller architecture than would be the case with a farm of regular servers. Like most clustering applications, another advantage of blade servers is that blade servers can be managed to include load balancing and failover capabilities. This can be done with a farm of regular servers as well, but since blade servers share much simpler and slimmer infrastructure and often come designed for this task from the manufacturer, load balancing and failover management tends to be easier with blades. In case any hardware failure is found on a server blade or the chassis itself, self diagnostics function automatically starts and the faulty area can be identified by the indicator display per server blade. A blade server most importantly reduces power consumption and improves power management. Consolidating power supplies into the blade chassis reduces the number of separate power supplies needed and also reduces the power requirements per server. Because individual server blades are stripped to bare minimum and do not have other features found in conventional servers such as keyboard, graphic cards, and others, that employ less devices that need to be powered. This reduces overall power consumption. One blade server with 16 server blades uses much less power than 16 individual full-size servers. Another big advantage over traditional servers. Blade servers often come with a single interface that is used to manage all individual servers within chassis. Server consolidation and resource centralization also simplifies server deployment, management, and administration. Hardware configuration management, operation status monitoring, and fault monitoring are centrally controlled, thus reducing the system administrator’s burden. Administrator can be notified of an error by such means as e-mail in a timely manner. When needed, the administrator can send out already-prepared disk images (OS and application software) all at once. This capability drastically reduces time required for system administration. Imagine that you have 16 individual stand-alone servers. Each of them needs to be connected to the network which calls for yards or even miles of cabling. Blade servers simplify cabling requirements and reduce wiring by a great percentage. Power cabling, operator wiring (keyboard, mouse, etc.) and communications cabling (Ethernet, SAN connections, cluster connection) are greatly reduced as well. Modern blade servers are designed in a way that it is possible to take out and add in server blades while the system is up and running with just a minor configuration in the admin interface. New processor, communications, storage and interconnect technology can be implemented in blades that install into existing equipment with no or minimal disruption to the functionality of the whole system. You can expand or reconfigure the system without stopping your jobs other than those related to the server blade subject to upgrade or replacement. Modules can mix in the same blade server chassis. Server blades within a chassis do not necessarily need to be identical. Depending on the particular type of your chassis, one server blade can have for example Intel Xeon and the other Intel Itanium. You can have one server blade with Windows and another one with Linux. The same applies for adding new server blades into the system. Once a blade server chassis has been installed, additional servers can be added by simply sliding them into additional bays while the system as a whole is up and running. Blades can be scaled up as needed by just simply adding a new server blade. It is certainly easier to deploy additional server blade than a new stand-alone server. Even though the purpose of packing server blades into a single chassis is to share servicing resources, chassis can be configured with redundant power modules for failover. What are the disadvantages of blades? As with anything, benefits do not come for free. Blades also include some disadvantages. Although plugging in a new server blade into the blade server is easy once the system is running, initial configuration can be labor-intensive and expensive in complex application environments. This disadvantage comes with the fact that blade servers are specialized computing equipment and their configuration and administration often requires training provided by the vendor which may not be cheap unless you have a special free-training deal with the vendor. If you do not fill the blade chassis with server blades, you are not fully utilizing it. It does not make much sense to purchase a blade chassis for $5,000 and then run the whole system with just 2 server blades in it. Blade chassis are often made to hold 14 or 16 server blades. The general rule of thumb is that blade servers are not suitable and economical for applications requiring less than 5-10 servers. Applications requiring less than 5-10 server blades (10-20 CPUs) are best devoted to standalone server systems. Blade systems vary between manufacturers. Once you spend $50,000 on a blade server from a particular vendor, it is not always easy to switch to another vendor because of servicing agreements and also because a competitor is unlikely going to have the same expertise in your equipment as your vendor. You could theoretically use your server blades in competitor's blade chassis, but practically blade chassis are not standardized. It is unlikely that IBM would get together with Dell and HP to share chassis. Chassis is what makes their products unique. Server blades are often designed to only run in the company's own chassis. Blade servers are not the best solution for everything. If you have a very large transaction processing application requiring high read/write ratios, then you may run into bottle neck with your bus speeds, memory limitations, disk access, and network I/O. Email and Web serving are situations where blade computing suits well. One often forgotten disadvantage is HVAC. While individual stand-alone servers can be distributed throughout the building and may not necessarily need special accommodations for cooling, blade servers being very powerful these days produce massive amounts of heat per square foot. If untreated, this could melt them down. When purchasing blade servers, it is important to keep in mind that additional resources will be needed also for HVAC.